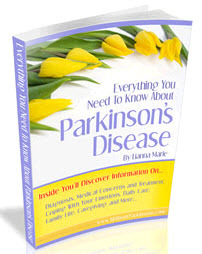 Motor symptoms and signs may be due to a neurological disorder causing organic brain syndrome, such as rigidity in Parkinson's disease, or may be related to emotional states such as restlessness or tremor in anxiety. However, there is a further group of symptoms which affect voluntary movements and often occur in functional psychoses. 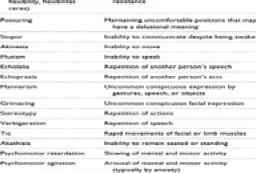 These symptoms are neither unequivocally neurological nor clearly psychogenic in origin and are termed motility disorder by some authors. Table.,,! gives a glossary of disordered motility. Whether patients are unable or unwilling to move normally is still a matter of debate. The origin of motility symptoms may well be a functional (rather than a morphological) abnormality of basal ganglia. A further classification of motility disorder distinguishes psychomotor hyperphenomena (e.g. tic disorder), hypophenomena (e.g. stupor), and paraphenomena (e.g. mannerism). *65» Tics are rapid irregular movements involving groups of facial or limb muscles. Stupor is a state in which a patient does not communicate, i.e. does not speak (mutism) or move (akinesia), although he or she is alert. Mannerisms are uncommon; they are conspicuous expressions by gesture, speech, or objects (e.g. dress) that seem to have a particular meaning, mostly delusional. A disorder characterized by disturbed motility is called catatonia. It occurs most frequently in schizophrenia, and less frequently in general medical conditions and major depression. A number of conditions, such as brain tumour, encephalitis, and endocrine and metabolic disorders, may elicit catatonic symptoms. Catatonia may take the form of hypomobility or immobility, and in extreme cases leads to catatonic stupor. Alternatively it may present as excessive motoric activity (catatonic excitement), an extreme state that might be harmful and dangerous to the patient and to others. An important symptom of catatonia is catalepsy, in which uncomfortable and bizarre postures are maintained against gravity or attempts to rectify them. An examiner trying to move a cataleptic limb passively will notice a 'waxy flexibility', which is quite different from rigidity or spasticity. Echo phenomena may occur when the patient is interacting with another person and present as echolalia (imitation of the speech of others) or echopraxia (imitation of the actions of others). Disordered speech may also be regarded as a sign of disordered motility, as shown in the signs of mutism or verbigeration, whereas aphasia is a focal neurological symptom. In delirium tremor often occurs as a vegetative sign. Anxiety is accompanied by restlessness. A particular motor pattern in delirium tremens (alcohol withdrawal delirium) makes it look as though the patient is collecting a large number of objects or brushing away dust from his blanket. Typically, the movements never seem to achieve what they are meant to and, of necessity, are therefore repetitive. Patients may show fragments of purposeful actions which, however, achieve no goal. Suggestibility in delirium may lead to movements which are based on erroneous assumptions, such as trying to take hold of a proffered, but non-existent, thread. Patients may develop panic and try to flee. Speech may be hurried and indistinct. In some cases of delirium, such as that due to hepatic failure, patients may be hypoactive before becoming drowsy and comatose. Hepatic failure may also result in catatonic disorder. A number of conditions, such as brain tumour, encephalitis, and endocrine and metabolic disorders, may elicit catatonic symptoms. Patients with a variety of mental disorders may show abnormal movements that are of histrionic nature. They may throw themselves to the ground, seek and maintain bodily contact, or show psychomotor agitation. Alternatively, there may be psychogenic paresis. In dementia there may be a general disturbance of psychomotor functions leading to disturbed co-ordination and clumsiness. During the further progress of dementia, lethargy and akinesia may occur. Sequelae of encephalitis are known to include a number of motor symptoms apart from parkinsonism; a frequently mentioned example from history is the epidemic of encephalitis lethargica that occurred around 1920. Tardive dyskinesia is rightly regarded as a side-effect of neuroleptic therapy. However, since signs of tardive dyskinesia such as perioral hyperkinesia and dystonias were described before the introduction of neuroleptics, (66> it is also a motor symptom of mental disorder in its own right. 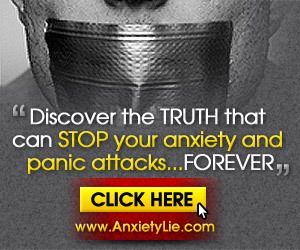 Stop Letting Anxiety Rule Your Life And Take Back The Control You Desire Right Now! You don't have to keep letting your anxiety disorder run your life. You can take back your inner power and change your life for the better starting today! In order to have control of a thing, you first must understand it. And that is what this handy little guide will help you do. Understand this illness for what it is. And, what it isn't.